A timely book containing the tools to get out of debt and improve overall credit The current economic climate has become increasingly volatile for the average American. As bankruptcy and foreclosure rates increase, more and more people are finding themselves with bad credit. 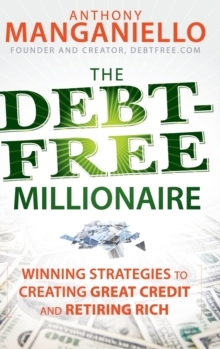 The Debt-Free Millionaire offers a plan for anyone who has had difficulty managing credit. This book is based on cash flow analysis, a unique program offered by author Tony Manganiello. The book explains the basics of budgeting (cash flow) along with credit basics including credit score, credit history, and outstanding loans. Using this knowledge as a base, it will show people how they can take charge of their credit to insure a lifetime of debt-free money management and financial success. Some of the topics touched upon by Manganiello include: cash-flow analysis, credit counseling, bankruptcy, debt settlement, the Fair Credit Reporting Act, credit reports, and consumer credit rights in all states. With this book as their guide, readers will develop a better understanding of credit and use that knowledge to create a permanent solution to their debt problems. Tony Manganiello (Dubuque, IA) is President and CEO of DebtFREE.com, Debt-FREE & Prosperous Living, Inc., and Tower Financial Corporation. He is regarded as one of the foremost experts on the impact debt-elimination services can have on a consumer's credit. Currently, he serves as a member of the Advisory Board of the United States Organization for Bankruptcy Alternatives and attends meeting with government officials providing testimony regarding the needs consumers face in today's economically challenging times.